We just ate 300lbs of lamb??? Thanks American Lamb Association! 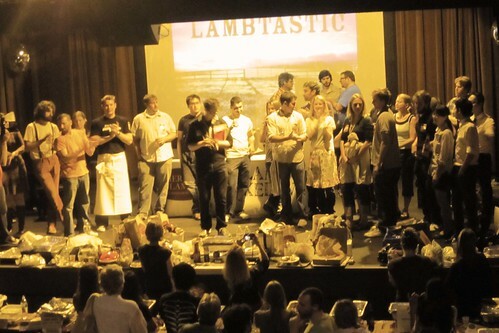 On Sunday afternoon, 20 contestants competed for Matt Timm's Lamb Takedown at the Highline Ballroom. This was overwhelmingly much more satisfying than the Tofu Takedown in May. I enjoy savory more than sweet! There were 3 professional judges: Josh Ozersky (The Feedbag), Daniel Maurer (NY Magazine), and George Motz (NY Food Film Festival). The audience were also able to judge in a separate People's Choice Award. 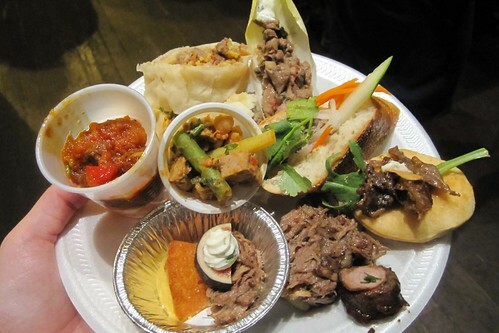 -I voted for the itty bitty falafel (on right of cup), stuffed with Chinese Xi'An Spicy Cumin Lamb with Pickled Jalepenos. They ended up winning People's Choice ($100 prize) and 3rd place from the judges. -I spit out the one in the cup, Yang Rou Chuan (tasty outer layer, too dry on the inside though). 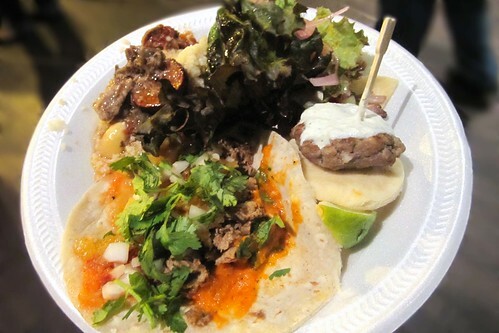 -The small taco won Judges 1st place-- but I wasnt in favor for the flour tortilla. Im corn all the way!! But having lamb butter was kind of a nice idea! 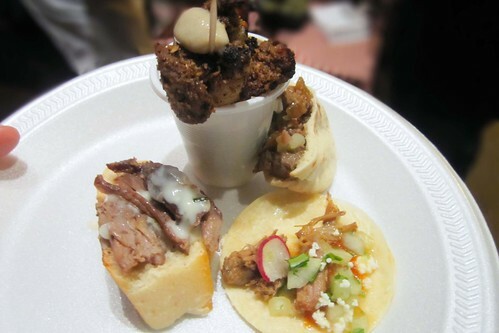 - Enjoyed the lamb sliders-- minus the carbs---thats just a filler! -The lettuce wrap was very Korean inspired-- Im surprised he didnt win bc I met multiple friends of his throughout the afternoon. -Banh mi....I ate more bread than lamb. -Pulled Lamb Shank with Pears (5 oclock) was my 2nd favorite (also won 2nd place with judges)-- there was a complexity of a perfectly ripe pear with the braised lamb...very pure. $15 = wham bam, thank you lamb! *Oh, if you dislike heavy metal musicc...Id skip on these events. I know right?? I prefer Beyonce myself too.